Cylinder & Keyway: 6 pin solid brass "C" keyway standard. APPLICATIONS - For offices, schools, hospitals, apartments, hotel/motel, residential, commercial and public buildings. BACKSET - 2 3/4" Standard. 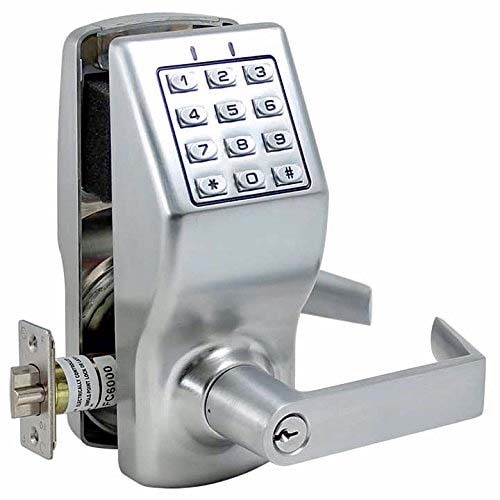 2 3/8", 3 3/4", 5", and 2 3/4" anti friction latch with 3/4" throw for pair of fire doors optional. POWER SUPPLY - 4 AA Batteries (comes standard in packaging) or external 6VDC. CLUTCH -Clutch technology allows turning of lever without retracting latch, thus prolonging the life of the lock by reducing stress on the spindle and other parts. STRIKES -ASA strike standard, "T" and full lip strike available on request. LATCH FACEPLATE -Standard 2 1/4" x 1 1/8" for 2 3/4" backset. Optional 2 1/4" x 1 1/8" for 2 3/8" backset. CYLINDER & KEYWAYS - 6 pin solid brass "C" keyway standard. Schlage E, Schlage C-K, Russwin D1-2-3-4, Corbin 59/60, Corbin-Russwin L4, Sargent LA-LB-LC, Falcon/Weiser E, Arrow A, Yale 8, Yale GA and Kwikset. 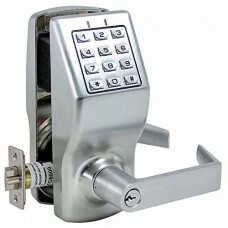 Can also accept Medeco, Assa, Kaba and Cal-Royal HSK High Security Cylinders. ANSI STANDARDS - Meets or exceeds BHMA/ANSI A 156.2 Series 4000 Grade 1 requirements. Exceeds 800,000 cycles. INTERCHANGEABLE CORE -Interchangeable Core locks will accept compatible 6 or 7 pin cores with BEST, FALCON and ARROW. Prefix "IC" before part number. KEYPAD - 12 programmable buttons for multi-level access functions including group or individual user codes, master and management codes, passage and emergency or service codes. Master Code - performs all programming functions. Sub-Master Code - performs all programming functions except delete or change Master Code. Manager Codes - CR3000 can accommodate 10 Managers each having different codes and under each Manager has 9 Users (Example: 1 Manager + 9 Users = 1 Bank). Managers are capable of programming/adding and deleting User codes under his Bank. Managers are also capable of accessing the next higher Bank until another Manager Code appears. Service Codes (5) - are one-time codes only. It cannot be used again. Once a Service Code is entered, the unit will unlock but will automatically delete the code. Passage Mode -Once enabled, the unit is unlocked continuously until "Disable Passage Mode" is initiated. Tones and LED Indicators -can be programmed for different settings. Making sure that every key pressed is confirmed by an accompanying LED and/or tone. Next Free Code Location Finder -No need of guessing what free location is available in entering a new code. CR3000 can pin point and tell you where the next available location is. Code Locator Function - CR3000 can tell you the exact location of a certain code. Making it easy to determine as to what manager a user code is under. Keypad Anti-Tamper Lockout -If an invalid code is entered 3 times in succession, the unit will turn off for 30 seconds to prevent tampering. Remote Switch/Release - CR3000 provides 2 Remote Switches. Either can be used for an emergency push button switch, or connected to alarm systems such as fire alarms. Weather Resistant - CR3000 are manufactured making sure that internal electronic parts are protected from moisture, dust, water and corrosion. All models are weather resistant for temperature ranges of +158°F to -22°F (+70°C to -30°C). Clutch Technology - The outside lever of the CR3000 is a freewheeling lever. If no valid code is entered, the lever will just turn freely without moving any parts inside, thus preventing breaking or tampering.